Being at the crossroads of four pilgrimage arteries in the Middle Ages, Siena was an important stopping place and market town for pilgrims, bankers, traders, artists and just about anyone whose business took them from northern French territories to Rome. Large, colorful and cheerfully noisy, this is one of the most popular markets in Tuscany. The seemingly endless line of display tables and trucks wraps around the Medici fortress every Wednesday from 7 a.m. to 1 p.m. and sells inexpensive clothing, cookware, utensils, jewelry, scarves, shoes, bags, belts, table linens and hardware items as well as cosmetics, plants and simple household furnishings. An entire section is devoted to food products, where regional cheeses, fruits and meats are sold. Every third Sunday of the month, Siena hosts a group of antiques dealers who set up tables in the historic covered market behind the Piazza del Campo. Here you can find many items that once belonged to noble families including dishes, furniture, mirrors, and artwork. This market also has stands for antique jewelry, farmers' tools, used designer bags and old books. The fun is in the browsing because you never know what you will find. Every Friday morning in the market behind the Piazza del Campo producers of biological products bring their organic produce to Siena to sell to the public. 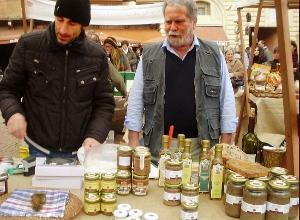 More recently Siena has revived the idea of the ancient medieval market. Held during the winter and spring months in the Piazza del Campo, this festive market features long tables displays of hand-made cloth and leather goods, unique clothing, jewelry, and many different types of regional and traditional foods. Medieval-style entertainment is on hand throughout the day, as jugglers, fire-eaters, stilt-walkers and scrolling musicians entertain the crowd. In the evening as the sun is setting, the flickering candlelight on the tables creates an evocative, romantic atmosphere.